Jan 21, 2015 filed under Fun Stuff. Virtue is for everyone — even this non-praying mantis. In the cartoon, he is exhibiting the virtue of honesty, and even humility — he is seeing himself as he is. There’s no better place for any of us to start. Can we ask ourselves what a virtuous life would look like? For me as a Christian, a virtuous life is one of joyful, creative self-giving. My model is Jesus Christ. 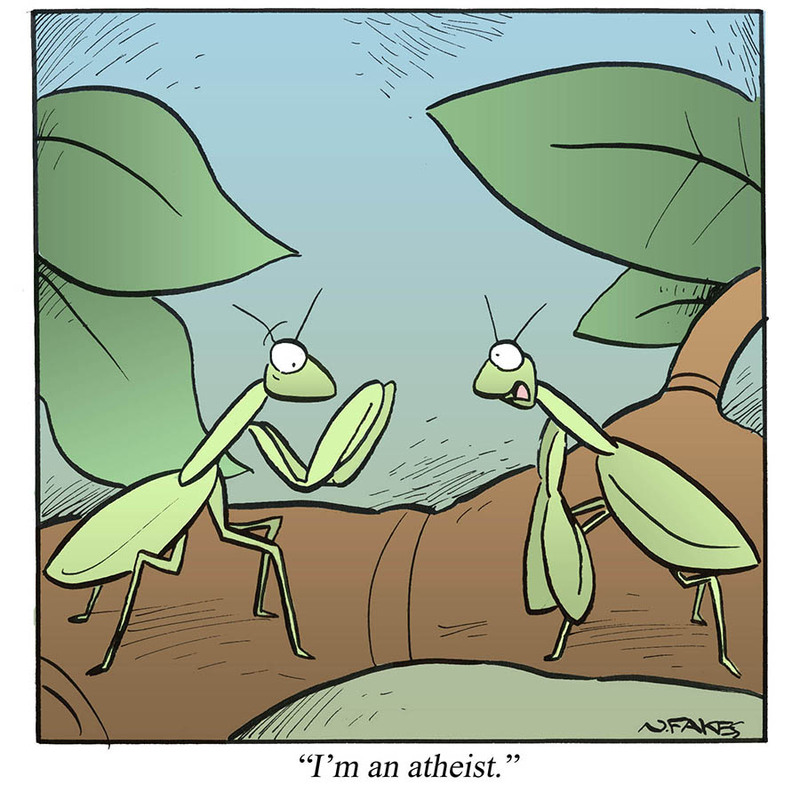 Can we be as honest as the mantis about where we are now? Here goes: although I’m more likely to think (and pray) before I speak these days, my old defensiveness too often determines what I say and do. On the other hand, I’m able to spontaneously do and say generous things that I couldn’t have done even five years ago. With practice, small, hard-fought victories are becoming good habits. An atheist friend asked me how someone like her fits into all this. I thought about it for a while and then it hit me – I’m not perfect, nobody reading this is perfect – so whether we have a relationship with God today or not, we’re all approaching virtue starting right where we are. We can learn from each other by sharing what’s worked and what hasn’t. Looking to be angry less often? Me too. Want to be more patient? Yep. Trying to see others in the best light, even when they’re driving us crazy? Join the club. We’re all in this together, so come on in, and come as you are. I have been often proud of all what I am been doing and I am selfish and do not always consider the feeling of others. I have anxiety , frustrated and don’t know how to be patient with my own life.I need help. Yes, virtue is for you, too! I signed you up for my free Top 10 Tips for Patience. And you’ll get my weekly message on growing your goodness, too. I hope you enjoyed our Rosary Conference last weekend!